For those Dragon’s out there, here is what the Chinese think of you! The key to the Dragon personality is that Dragons are the free spirits of the Zodiac. Conformation is a Dragon’s curse. Rules and regulations are made for other people. Restrictions blow out the creative spark that is ready to flame into life. Dragons must be free and uninhibited. The Dragon is a beautiful creature, colourful and flamboyant. An extroverted bundle of energy, gifted and utterly irrepressible, everything Dragons do is on a grand scale – big ideas, ornate gestures, extreme ambitions. However, this behaviour is natural and isn’t meant for show. Because they are confident, fearless in the face of challenge, they are almost inevitably successful. Dragons usually make it to the top. However, Dragon people be aware of their natures. Too much enthusiasm can leave them tired and unfulfilled. Even though they are willing to aid when necessary, their pride can often impede them from accepting the same kind of help from others. Dragons’ generous personalities give them the ability to attract friends, but they can be rather solitary people at heart. A Dragon’s self-sufficiency can mean that he or she has no need for close bonds with other people. My mum is possibly the most amazing cook I know, not because her food is the most delicious but because it’s tasty AND she has a knack of producing a spread of 5 separate dishes every Sunday. 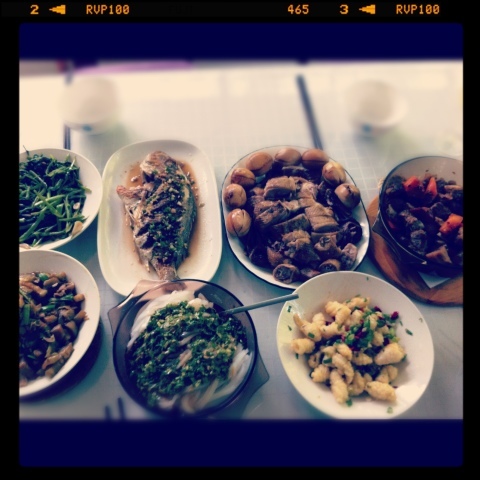 Check out the feast she put on for CNY? Dried fried whole fish, sweet and sour pork ribs, sour spiced hand cut mung bean noodle, chilli calamari, roast duck… Nom nom nom! !